Wyalusing History; the Park, the People, the Land, was 24 years in the making. 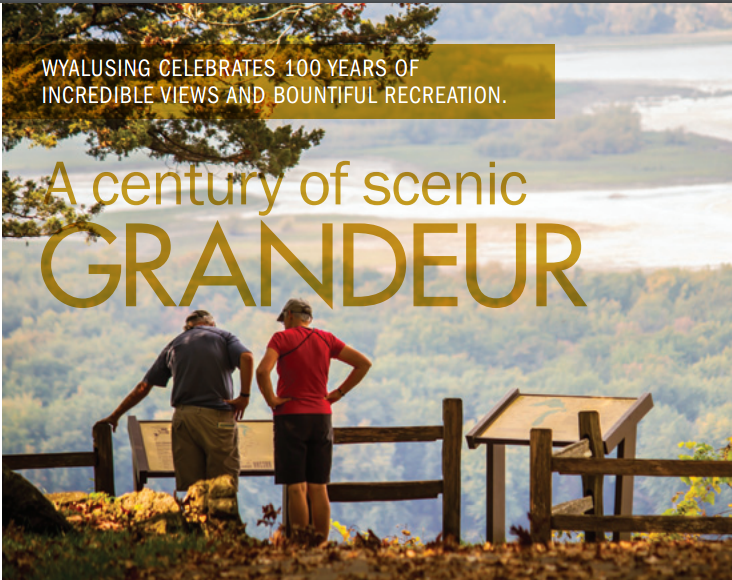 Paul Kosir's book, can be yours just by traveling to Wyalusing State Park Visitor Center. Paul Kosir served as the park naturalist from the late 1970's through the early 1990's. During Kosir's tenure, he guided park visitors around the trails, provided interpretive talks, as well as portrayed "characters" who brought the park's beauty to others. 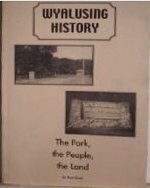 In the second edition of Wyalusing History, the Park, the People, the Land, last published in 2004, Paul Kosir takes the reader through the park with the same skill he used as a naturalist, this time, however, through the use of the written word. Photographs provided by park archives as well as people who resided within the boundaries, provide interesting perspective as the reader is travels through periods of history. Kosir's vivid descriptions of trails, no longer marked on the Park's maps, will bring back memories of those who have walked on the same trails of the Native American, or immigrants traveling to their new home in the west. His story of Big Sand Cave will provide a mixture of humor as well as tragedy. Some may call the moral of the story "just desserts". Paul Kosir's Wyalusing State Park is the same park as it was in the past and as it will be in the future. Memories created today may have been the same memories of long ago: young visitors gazing across the valley at Point Lookout, sharing secret words, ending with "I do"; senior citizens, looking up at the flood record sign at the boat landing, reminiscing about the big flood of the '50s; and treasure hunters, equipped with the latest electronic gadgetry, crawling to the back of Treasure Cave in search of long lost treasures. For some readers, Paul Kosir's book will serve as a reference as he describes the miles of discovered and rediscovered trails. Still, others, will find Kosir's story of the people who called the lands of the park an interesting read. Stop in the Park Office. Buy yourself a copy of the book, and while you are visiting, pick up a copy for a friend. All profits are returned to the Friends of Wyalusing State Park. On May 21, 2009, The Friends of Wyalusing State Park was the very first Wisconsin State Park Friends' group in the state to start an endowment fund. The endowment fund was to become a perpetual source of financial assistance to support recreation, education and environmental stewardship of Wyalusing State Park. The interest generated from the fund will directly benefit our work with the park and will help to create a more enjoyable experience for visitors as well as protecting the beautiful natural resources that can be found within the park. 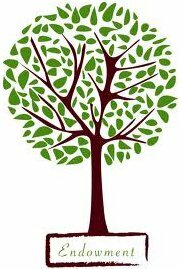 An endowment fund is a large savings and investment fund managed by professional financial services, provided by The Natural Resources Foundation (NRF). The endowment fund started with a a "small acorn" of $1000 which was provided by the Friends of Wyalusing though the profits of the Friends operated Concession Stand as well as individual donations. We were required to "grow" the fund by $1,0000 per year. When $10,000 was reached The Friends would receive a percentage of the interest on the account every year. Today, only two years later, the endowment fund has exceeded the $10,000 goal. The more we get into the fund, the more interest The Friends will have to use for the benefit of the park. The Friends of Wyalusing State Park need your help! Consider a lasting donation. A donation to the endowment fund would be a lasting and continuous gift. Every dollar you give to the fund works to provide more educational projects and provides more opportunities for visitors in the future. Donating is easy: Download and print this PDF document. 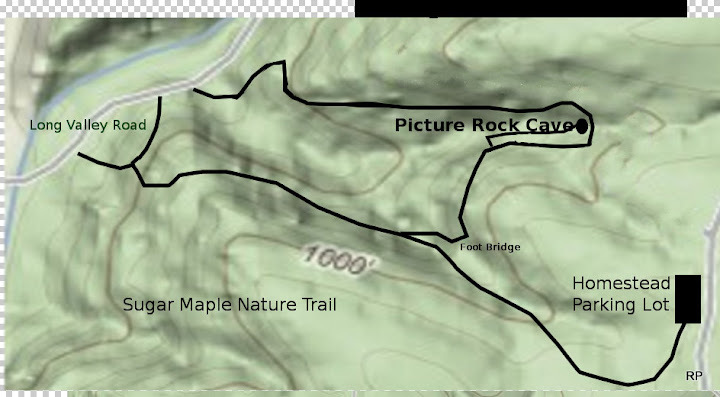 (Click here) Make checks payable to the Natural Resources Foundation and mail to: Natural Resources Foundation, Attn: Friends of Wyalusing State Park Endowment Fund., PO Box 2317, Madison, WI 53701. The Natural Resources Foundation and The Friends of Wyalusing State Park are 501(C)3 tax exempt organizations. Contributions are tax deductible. Or, stop at the Park Visitor Center and ask for an Endowment Information brochure.